It’s news no one wants to hear, but everyone should note: a cooler winter, higher state regulatory fees and the recently passed rate increase will push utility bills higher this winter. Residential customers can expect to see their bills increase by a little more than 10 percent, CPS Energy analysts calculated, from an average of $126.69 for each of the four months of November through February, to $140.11. That includes a projected increase in natural gas use from 39 ccf to 49 ccf, because this winter is expected to be more in line with typical winter weather, in contrast to last year’s unseasonably mild temperatures. Electricity use is also expected to increase from 943 kWh to 985 kWh a month, averaged over that four month period. Those who use more natural gas and electricity will see higher bills. In December, state regulatory costs will go up; those costs are passed through to CPS Energy customers in the form of a regulatory adjustment factor on utility bills, which is based on consumption. For example, a customer who uses 1,000 kWh of power in November would see a regulatory charge of $6.52; in December that would rise to $9.36. Those costs are approved by the Public Utility Commission of Texas and passed along to all Texas electric customers. They include fees from the Electric Reliability Council of Texas, which runs the state electrical grid, and NERC (North American Electric Reliability Corporation), which ensures grid reliability, plus expenditures associated with the transmission grid. Utilities’ fees are based on their share of the grid. On Feb. 1, the 4.25 percent rate increase approved by the City Council on Nov. 7 will take effect. The increase will raise the average residential customer’s electric and gas bill by $4.68; again, those who use more power will see higher bills. The average bill for the month of November is projected to be slightly lower than last year, say analysts, from $112.73 down to $109.30. That’s because temperatures last November ran slightly colder than projections for this month. 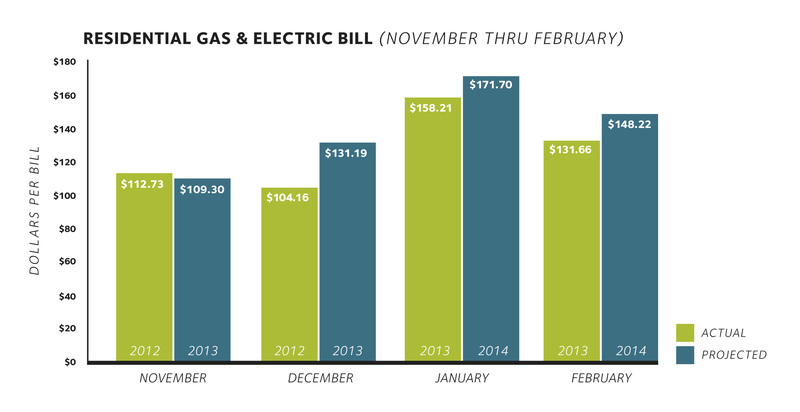 But December through February is expected to be colder, so that’s when customers will notice higher bills. CPS Energy offers many ways to save energy and help reduce bills. If you’re planning on buying new appliances this season, look for the Energy Star label as a way to reap long-term savings. Rebates for insulation and other products to reduce energy use can be found at http://www.cpsenergysavers.com. The site includes free and low cost “quick tips” as well. Low income customers may be eligible for free weatherization measures through the Casa Verde program. CPS Energy is also expanding its Affordability Discount program, which helps qualified customers by reducing their monthly bill by $12.30 for gas and electric service. That’s more than the amount of the rate increase. CPS Energy has other programs to help low income customers pay bills, including the Residential Energy Assistance Program, known as REAP. ← Want to boost those holiday deals? Read the energy label. You failed to post on the graphs the bonu$ package$ your administrators would be getting. Next year.